It has been a very crazy summer and there is so much I want to talk about! Where to begin? With Pennsic 42, the most epic two weeks of the year? With my discovery of the meaning of life? With a chance encounter and my new friend? How about this. It will all make sense in the end, I promise, but getting there…well it’s always an adventure, right? I’m going to start with the fortune cookie I got on Day 2 of Pennsic Set-Up, when Janeen and I brought dinner back after our final town run. The fortune cookie said “Talk is cheap, barbers give it away free with haircuts.” And that cookie really made me sad. I thought about my Granddad (a barber) and all the great talks and advice he gave to generations of customers over the years. When he passed away I made sure my email address was included in the obituary because I wanted to hear stories from strangers about what a great person he was. And man those stories poured in! I am pretty sure if you asked them, they would tell you that it was the talks more than the haircuts (though those were great too) that kept them coming back time after time. And in today’s technologically stifling “connected” world, the ability to have a decent conversation is a dying art. Talk isn’t cheap, its priceless! The next two weeks at Pennsic really reinforced the priceless-ness of real communication. I’ll be honest it was a little sad this year because many faces in our guild were missing due to severe illness. We felt their absence. I had hoped the somber tone would result in more evenings spent together under the communal big top tent, as we all drew strength from our community. What a strange community it is. The guild, which was formed long before I ever showed up, is a collection of vendors who wanted to work together to make their part of the marketplace beautiful and engaging. The vendors became friends, some of whom see each other regularly, and some of whom only see each other for those two weeks each year. And yet despite the gaps in time, or maybe because of the quality of the visits, strong friendships were formed and kept. I know that I personally consider the girls, daughters of original vendors, some of my closest friends on the planet, any time of year. But I digress. I do not want to make it seem that Pennsic 42 was a depressed or deflated Pennsic. There was much laughter and many happy memories made. I can’t begin to describe it. But there were lists. Sheets and sheets of silly things said and done. Late night talks held over jars of Apple Pie, and later night adventures had with Celts, Mercenaries, Sicilian Travelers, and other strange and interesting new friends. It was a refreshing and healing sense of connection and community after the crazy chaos of the previous month on the road (see Moccasisters Unite). I wish I had pictures to show you, but someone cough*cough**Amber* kept all the good prints. Sunset on Battle Road while the Camelot Guild plays drum head Frisbee. 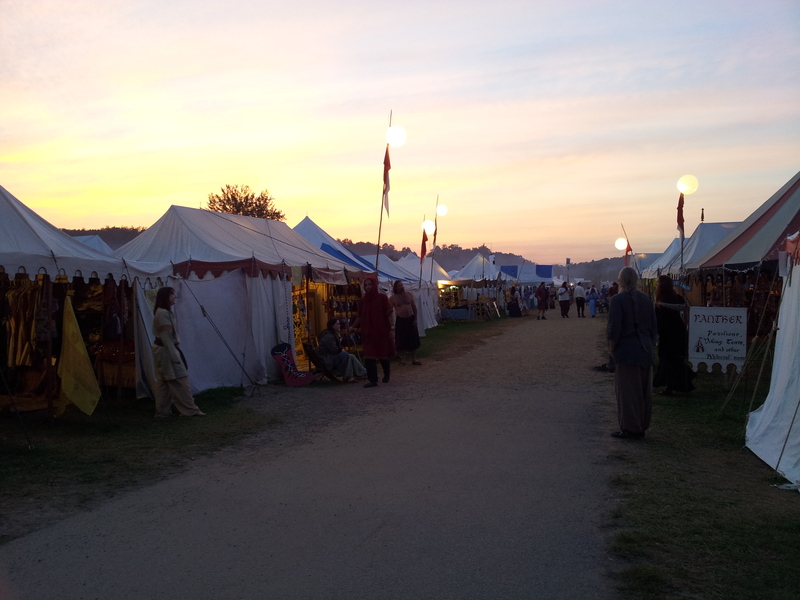 By the time I got back from Pennsic my Wanderlust was really starting to kick in. Like Pennsic, I’ve realized that traveling is a bit of an escape for me. I get to see amazing new things, and have some really wonderful moments with complete strangers. Right on time, a travel angel came into my life. I think this was my first American travel angel. I met this travel angel at the Best Buy in Liverpool, NY. I had taken the van in to finally get the radio replaced, and when the technician, lets call him Jack, was finished we realized that the van only had one working speaker! At least I have one I joked. But Jack, after chatting for a bit, offered me the gift of sound. He had extra speakers that would fit, he said, would I like him to put them in? Um, YES Please! When I dance with the hoop it is a sharing of energy. Sometimes I stand still and the hoop swirls around me. Sometimes I move and the hoop stands still, and sometimes we move together. It is the same with energy: sometimes it moves around me, sometimes it moves through me, and sometimes it moves with me. With the hoop sometimes I explore how long I can keep the hoop moving around me before I fall or drop it. With balance I can move many different ways for a long time. But without balance I just fall over and that’s no fun. So that is why we need opposing energy and balance in our lives. Because it is more fun to dance than to fall down. The speakers took much longer than Jack anticipated to put in, so we pushed off our hike in the woods until the next day. His woods were great; good run through the trees like Pocahontas woods. We found cool mushrooms and talked more about life, the universe, and everything. 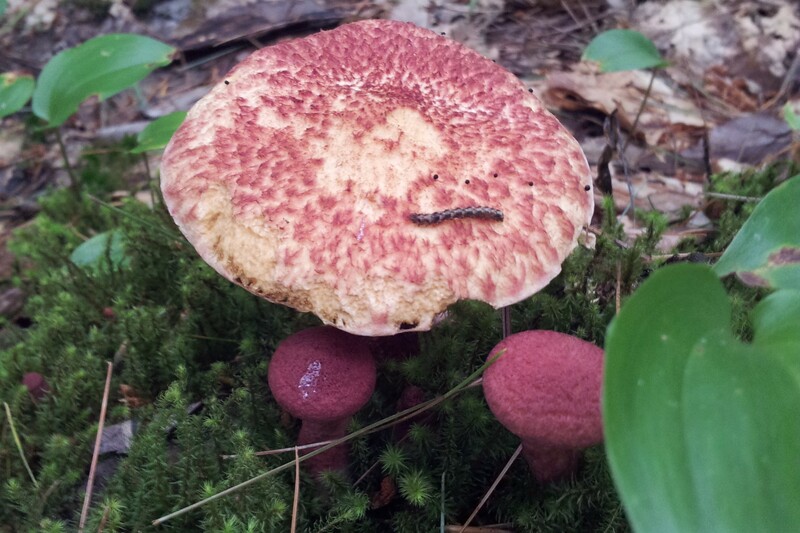 A caterpillar on a mushroom! Where’s his Hookah? Where’s the White Rabbit? In the Hitchhiker’s Guide to the Galaxy , Douglas Adams says that the answer to “life, the universe, and everything” is 42. The problem is, no one thought to ask what the question was and so little was solved. But I’ve realized that for me the meaning of life IS that moment when one laughs and says “Well what is the question then?” The meaning of life is the conversation that ensues. And later, the time spent thinking about the new things learned or realized because of that conversation. And then later, the moments when you get to share those new realizations with other humans and the cycle continues. Life is a spiral. It is dancing with a hula hoop. It is shared energy and balance. At least, that’s the best I’ve been able to come up with so far. What about you? Fellow Rennie popping in to say HI :) and BTW, I love your skirt in the pic. Did you sew it yourself? Hi Valarie! Thanks for visiting! And yes I DID sew that skirt. It is a Gnomie Daisy Skirt. All the Gnomie skirts are one of a kind because they are made from up-cycled fabrics, but I can totally make you one if you have a general color scheme in mind. Pleased to have been your only American travel angel. I wish you success in your future business and safety in your future travels. A scant week or so ago I didn’t know fairies really existed, now I am now firmly convinced the world needs more, particularly of your caliber. I also wanted you to know that the synergy you keenly sense from being ensconced in your hula-hoop is a stark correlation to how I feel when I can manipulate a project from a fiber of thought into its final physical form… true beauty! “”Jack” the Viking” – Your humble travel angel! Jack, I just want to thank you again for helping me with my speakers. They are wonderful and loud and make driving that big white van an absolute delight! I never realized how generous a gift the gift of sound could be.